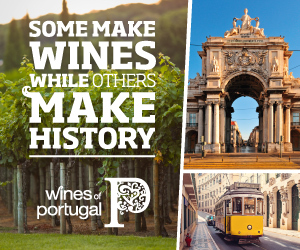 Work which, I might add, helped to forge the modern era of Douro wines and Ports. While de Almeida took a tip from the top (his father’s successful creation of Barca Velha) when he made Duas Quintas from low (Quinta de Ervamoira at 110-340m) and high (Quinta dos Bons Ares at 600m) sites (hence the name – duas means two), Ervamoira was the first Douro quinta to be block planted (i.e. with single varietal parcels) and vertically planted. 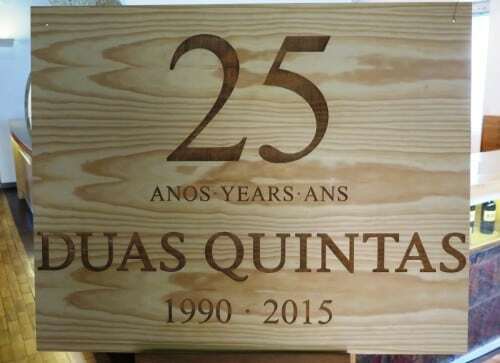 You can read more about this early, innovative history of the Duas Quintas brand in my report of a visit to Quinta de Ervamoira. Quinta de Ervamoira is located in the Douro, sub-region of Douro Superior and covers a total surface area of 234 hectares, with altitudes which vary between 110 and 340 metres. In Ervamoira the vertical form of planting has been exclusively used (vineyards laid out without terraces) and local grape varieties – such as Rabigato, Viosinho, Folgazão for the whites and Touriga Nacional, Touriga Franca, Tinta Barroca and Tinta Barca for reds – are planted in their own plots (block planted). 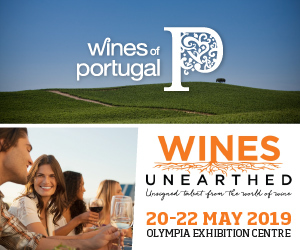 The soils at Quinta de Ervamoira are part of the Ante-Ordovician greywacke and schist complex. In this homogenous geological context Quinta de Ervamoira draws its originality from the diversity of exposures provided by the amphitheatre in which it is located. The Mediterranean/Continental climate tends to bring cold winters and very hot and dry summers, with an average annual rainfall of 300 mm. The wines produced here are full bodied and very concentrated. 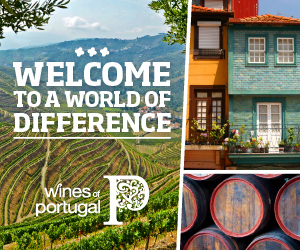 Quinta dos Bons Ares is also located in the Douro Superior sub-region. With an altitude of 600 metres, the vineyards are situated along a gentle slope of the hill. It has a total surface area of 50 ha and is planted with different grape varieties. Quinta dos Bons Ares is located in the Douro region in one of the rare granite outcrops. The soils are granitic, with a sandy loam texture, of which nearly 80% is sand. They lack structure, are poor in organic materials and higher in acidity than is usual in the region. With low water retaining capacity, the water table is very close to the surface. Here, the altitude provides cooler temperatures during the year and also a higher annual rainfall, around 500 mm per year. The wines produced here are fresh, aromatic and with a very well balanced acidity. 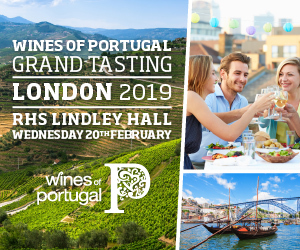 The overall aim, he explained, “is for the fruit not the wood to dominate – early vintages had more wood and are not our taste.” But this is a Portuguese take on fruit. Few Portuguese white wines wear their fruit on their sleeve and, for me, the triumph of the Duas Quinta whites is the sheer subtlety and luminosity of their multiple, mutable watercolour shades. Here are my notes on the wines, in each case preceded by Ramos Pinto’s short description of the vintage (in italics/bold) and vintage, vinification and varietal summaries. 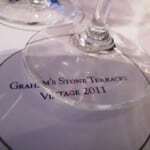 My stand out vintages? Of the Classicos: 1994, 2000, 2007, 2011 & 2014. Of the Reservas: 2008, 2011 & 2014. I’ll report on the Duas Quinta Tinto Classico (1990-2013) & Reserva (1992-2013) next Friday. Climate: 1994 was an excellent year, with amazing weather conditions. The soils had absorbed enough water after a rainy winter and spring. A hot summer followed by some rain early September produced perfect ripe grapes. Vinification: The grapes selected from Quinta de Ervamoira and Quinta dos Bons Ares are carefully harvested by hand to be vinified at the winery of Quinta dos Bons Ares. After 48 hours of skin contact maceration, the grapes were pressed. 50% of the clean must fermented in stainless steel vats at 18°C and the remaining 50% in new French oak casks. The wine was bottled in the spring of 1995. Climate: An atypical year. A dry winter characterized by a hot February, with the vines bursting early and full of strength. It was followed by a rainy spring and a cold May. The lower altitudes, which registered higher temperatures were more protected, but the higher quotas were eventually affected by this weather change. Maturation developed in a very irregular climate until the arrival of the equinox with ideal temperatures. 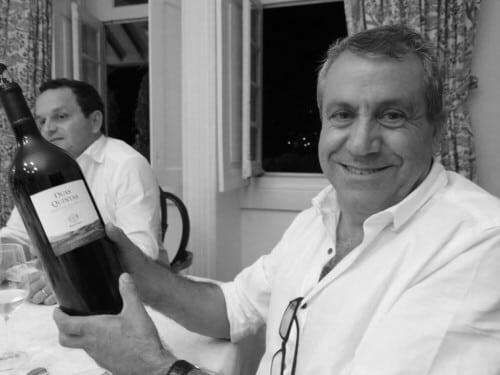 The long, hot and dry summer raised the sugar levels, the concentration of colour and the ripening, which resulted in tannin-rich wines of excellent quality, making this a memorable harvest. Vinification: The grapes selected from Quinta de Ervamoira and Quinta dos Bons Ares are carefully harvested by hand to be vinified at the winery of Quinta dos Bons Ares. After 48 hours of skin contact maceration, the grapes were pressed. 50% of the clean must fermented in stainless steel vats at 18°C and the remaining 50% in new French oak casks. The wine was bottled in the spring of 1998. Climate: A difficult year with climatic upheavals that resulted in a difference in the quality of the grapes on the higher levels (medium quality) and the lower levels (great quality). The condition of the grapes varied greatly, therefore a surgical vintage was necessary and this resulted in a significant fall in production. Vinification: The grapes selected from Quinta de Ervamoira and Quinta dos Bons Ares are carefully harvested by hand to be vinified at the winery of Quinta dos Bons Ares. After 48 hours of skin contact maceration, the grapes were pressed. 50% of the clean must fermented in stainless steel vats at 18°C and the remaining 50% in new French oak casks. The wine was bottled in the spring of 2000. Climate: The winter was exceptionally dry and with hardly any rain from October until the end of February. However, April was cool and damp and the rain persisted until May, therefore the precipitation registered was three times higher than usual. Flowering took place in May under very humid conditions, leading to a decrease in fruit production. All these conditions resulted in one of the smallest harvest we have ever had. July and August were characterised by the occurrence of some showers that proved very useful, although it was not a very hot summer, by which at the end of August, maturation was slightly delayed. September began with an abnormally warm period, leading to a rapid maturation. At the start of harvest, the fruit was in excellent condition. Vinification: The grapes selected from Quinta de Ervamoira and Quinta dos Bons Ares are carefully harvested by hand to be vinified at the winery of Quinta dos Bons Ares. After 24 hours of skin contact maceration, the grapes were pressed. 75% of the clean must fermented in stainless steel vats at 18°C and the remaining 25% in new French oak casks. The wine was bottled in the spring of 2001. Climate: The winter of 2001 will surely be remembered for the extraordinary amount of rainfall and the damage caused by the deluge that continued for five months. Bud burst took place in mid-March, earlier than usual, due to the higher than the average temperatures throughout the winter. Flowering took place in May as the vineyard development slowed down due to mild weather conditions in early spring. Temperatures throughout the summer were not excessive and useful amounts of rain were experienced throughout July and August, with maturation taking placeunder favourable conditions. Vinification: The grapes selected from Quinta de Ervamoira and Quinta dos Bons Ares are carefully harvested by hand to be vinified at the winery of Quinta dos Bons Ares. After 24 hours of skin contact maceration, the grapes were pressed. 75% of the clean must fermented in stainless steel vats at 18°C and the remaining 25% in new French oak casks. The wine was bottled in the spring of 2002. Climate: The winter of 2001/2002 was relatively dry in the Douro region. The large fluctuations in temperature continued through most of the winter and brought about a later than usual bud burst in mid-March. April is typically a wet month in the Douro but the dry conditions continued and very little rain fell. Flowering took place in mid-May under dry but cloudy conditions, leading to a reasonable fruit set. The summer was mild, which was fortunate because low levels of rainfall continued throughout this period. The vines resisted the dry conditions surprisingly well, partly due to sporadic showers. August was unusually mild and in September we approached the harvest with confidence. Everything indicated that we were building up to what might be a classic year: low yields, some water stress, grapes in near-perfect condition and mild weather conditions for a balanced ripening. Vinification: The grapes selected from Quinta de Ervamoira and Quinta dos Bons Ares are carefully harvested by hand to be vinified at the winery of Quinta dos Bons Ares. After 24 hours of skin contact maceration, the grapes were pressed. 75% of the clean must fermented in stainless steel vats at 18°C and the remaining 25% in new French oak casks. The wine was bottled in the spring of 2003. Climate: Total precipitation during the 2003 wine-growing year was within the normal range, despite being marked by highly irregular distribution. From early spring to late May, there was no rainfall at all. Bud burst occurred in March and was normal. Flowering took place in the second half of May under excellent weather conditions. Ripening progressed during a very hot and dry period, with average temperatures of 45°C. This caused an increased concentration of different components and contributed to a perfect state of health for the grapes. Temperatures remained high during the harvest, producing small grape berries with a good concentration of sugar, aromas and smooth tannins. Despite all this, it was a good year with slightly irregular temperatures, but one which ultimately produced rich, concentrated wines. Vinification: The grapes selected from Quinta de Ervamoira and Quinta dos Bons Ares are carefully harvested by hand to be vinified at the winery of Quinta dos Bons Ares. After 24 hours of skin contact maceration, the grapes were pressed. 75% of the clean must fermented in stainless steel vats at 18°C and the remaining 25% in new French oak casks. The wine was bottled in the spring of 2004. Climate: Despite extremely dry conditions, 2005 produced excellent wines. In late August, the vines showed signs of high stress. The previous winter had been very dry. There was great concern over that year’s harvest when August came to a close without any signs of rain. But the weather changed in early September with a constant rainfall during some of the harvest days. The rain gave way to a clear sky, offering ideal conditions, cool nights and a heavy dew for the remainder of the harvest. 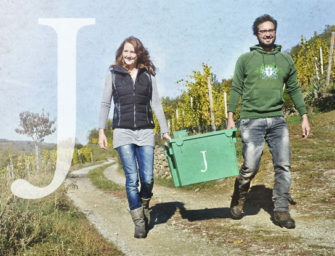 Vinification: The grapes are harvested by hand and packed in small boxes and selected upon their arrival in the winery. After a short skin contact maceration, they were pressed. The clean must fermented at controlled temperatures in stainless steel vats (80%) and new French oak casks (20%). The wine was bottled six months later. Climate: In the Douro region, 2006 was a hot and variable year with increased ripening. 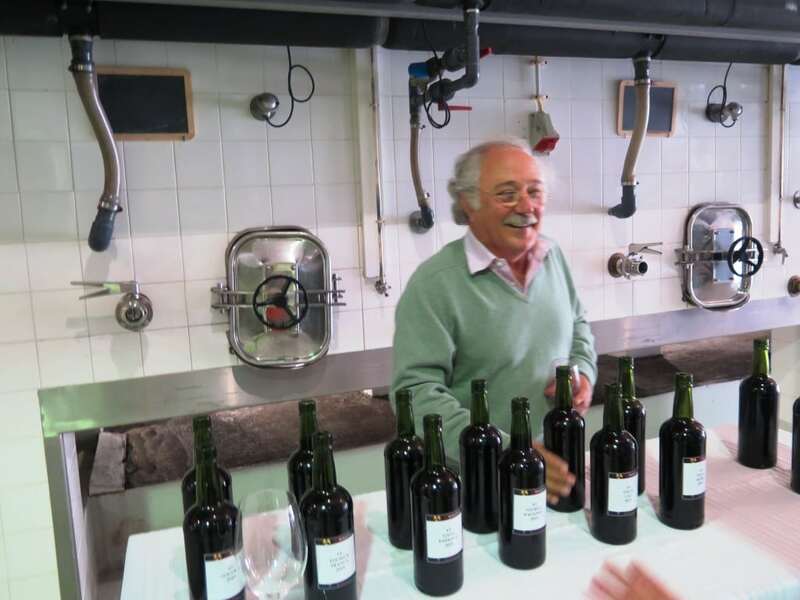 At Quinta de Ervamoira, the harvest began very early due to the high temperatures recorded in early September, after a relatively cool August. The freshness and fruit of the picked grapes at this estate, together with the grapes harvested at Quinta dos Bons Ares, gave our wines balance and harmony. Climate: November and February were very wet, as was the month of May, and the month of June in particular, which was wet and cool, mainly in the Douro Superior. This originated a slow, gradual maturation of the grapes on our quintas, which attained their ideal condition with the rise in temperature in early September, which was dry and hot. This development of the maturation produced an optimal acidity/sugar balance, strength and great aromatic expression in the grapes, characteristics that define 2007 wines. 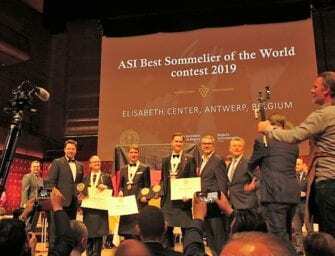 Vinification: The grapes are harvested by hand and transported to the winemaking centre in small boxes and selected by variety and vineyard; 85% of the must is obtained by direct pressing and 15% was free-run after skin contact. The clean must is fermented in stainless steel vats at low temperature (80%) and in French oak casks (20%). This wine was bottled in March 2008. Climate: 2009 was a very dry and hot year in the Douro Superior. The high temperatures registered at Quinta de Ervamoira accelerated the harvest. At Quinta dos Bons Ares the extreme heat didn’t affect negatively the final maturity, on the contrary, it improved it due to smoother and constant temperatures and the fresh nights. 2009 was characterised by a fast maturation of the grapes in the lower quotas, compensated by the equilibrium of the higher quotas. The final result was surprising. Vinification: The grapes are harvested by hand and transported to the winemaking centre in small boxes and selected by variety and vineyard; 85% of the must is obtained by direct pressing and 15% was free-run after skin contact. The clean must is fermented in stainless steel vats at low temperature (85%) and in French oak casks (15%). This wine was bottled in March 2010. 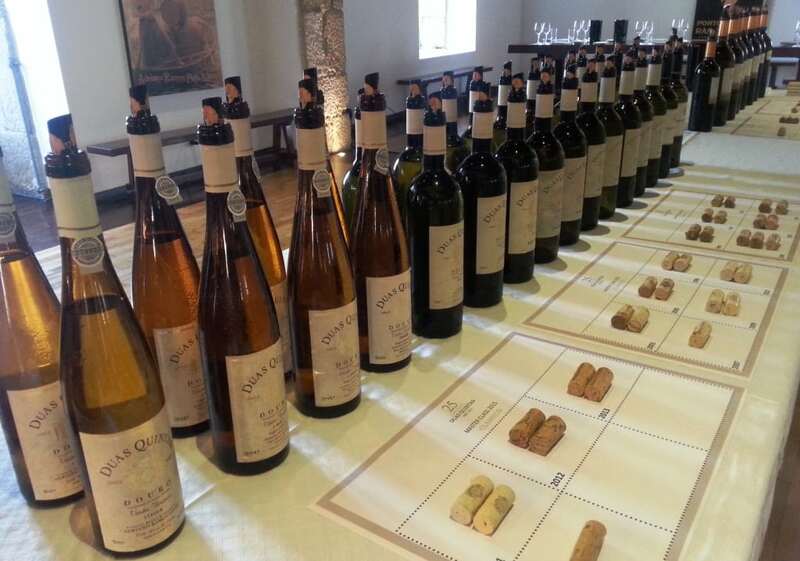 Climate: 2010 was a good year in the Douro Superior, both in quality and in quantity. 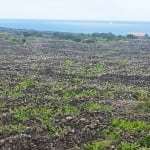 The vegetative cycle was delayed due to the low temperatures and rain during the spring. The relatively slow maturing was very positive. The high temperatures of late July and early August accelerated the maturation of some grape varieties but caused a block on maturation in part of the plots. As a result, it ended up being a very rigorous and selective harvest. The qualitative results are wines in which elegance stands out. Vinification: The grapes are harvested by hand and transported to the winemaking centre in small boxes and selected by variety and vineyard; the must is obtained by direct pressing after cold maceration. The clean must is fermented in stainless steel vats at low temperature (90%) and in French oak casks (10%). This wine was bottled in February 2011. 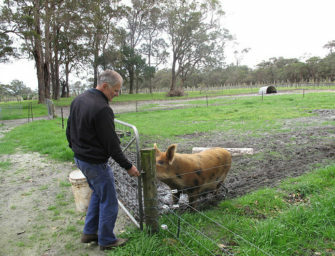 Climate: 2011 was preceded by two dry winters, which led to an early vineyard growing cycle, followed by a warm, wet spring and a dry summer with cool nights. The harvest started early with high temperatures and the maturation took quite a long time. 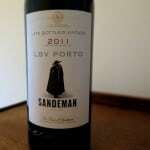 This climate produced very aromatic and intense dark wines, with a fantastic acidity. It’s hard to say exactly how a great vintage happens, or which factors contribute to success – science cannot explain everything! Vinification: 2011 was the first year that the winery of Quinta dos Bons Ares received the white grapes in a cold chamber, before falling by gravity into the press. These innovations allowed a huge improvement on the vinification process of the Duas Quintas white. The grapes are harvested by hand and transported to the winemaking centre in small boxes and selected by variety and vineyard; the must is obtained by direct pressing after cold maceration. The clean must is fermented in stainless steel vats at low temperature (90%) and in French oak casks (10%). This wine was bottled in February 2012. Climate: 2012 was characterized by a low rainfall winter, cool spring temperatures and an early summer. High temperatures in August and very cool nights contributed to the excellent ripening of the grapes. These factors were especially reflected in the small size of the grapes, in their concentration and freshness. Amplitude and refinement are the two main features of the wines we produced in 2012. Vinification: The grapes are harvested by hand and transported to the winemaking centre in small boxes and selected by variety and vineyard; the must is obtained by direct pressing after cold maceration. The clean must is fermented in stainless steel vats at low temperature (90%) and in French oak casks (10%). This wine was bottled in March 2013. Climate: 2013 witnessed a rainy winter and a wet spring, followed by a hot summer, which a priori indicated a year with good characteristics. The low spring temperatures reflected on the small size of the berries (especially at Quinta de Ervamoira), with a direct impact on the concentration of the wines, which became one of the main characteristics of the wines of this harvest. Vinification: The grapes are harvested by hand and transported to the winemaking centre in small boxes and selected by variety and vineyard; the must is obtained by direct pressing after cold maceration. The clean must is fermented in stainless steel vats at low temperature (90%) and in French oak casks (10%). This wine was bottled in February 2014. Climate: In terms of climatic characteristics in the Douro Superior, 2014 was marked by a dry winter and a warm spring, which speeded up the vine’s vegetative development. The summer was relatively cool with some heat spikes. Grape maturity was regular and more advanced than in 2013, so the harvest occurred 10 days earlier than usual. The September rains came after the white grapes had been harvested. 2014 has produced expressive, vibrant wines with good acidity. Vinification: The grapes are harvested by hand and transported to the winemaking centre in small boxes and selected by variety and vineyard; the must is obtained by direct pressing after cold maceration. The clean must is fermented in stainless steel vats at low temperature (90%) and in French oak casks (10%). This wine was bottled in April 2015. The first Reserva in our line up, the 2002, was a trial run. I asked de Almeida why it took so long to release a Reserva. He explained that he only started isolating wines for a possible Reserva around 2002. By then he had a better handle on the different grape vareties and had more varieties to play with, including Folgazão. Additionally, de Almeida was concerned not to ameliorate the Duas Quintas Classico. Tasting note: golden, a little cloudy and cidery. Oxidised. Climate: 2008 started with a quite cold winter though not very rainy, followed by a rainy spring the rains providing high water supplies for the soils. During summer and harvest time the temperatures were exceptionally low in the region, resulting in a very long and soft ripeness of the grapes, especially Touriga Francesa. The harvest began a fortnight later. The crop yielded sound grapes with good concentration and freshness, which ultimately produced exceedingly appealing wines of the same characteristics. Vinification: Driven by curiosity and interest in exploring the more traditional values and most modern techniques such as instruments, we selected 7 white Douro grape varieties from our estates of Ervamoira and Bons Ares. These white grapes were carefully harvested by hand and pressed. The must fermented in French oak casks where, after turning into wine, it matured during 7 months on fine lees. The wine was bottled in June 2009. Climate: 2009 was a very dry and hot year in the Douro Superior. The high temperatures registered at Quinta de Ervamoira accelerated the harvest. 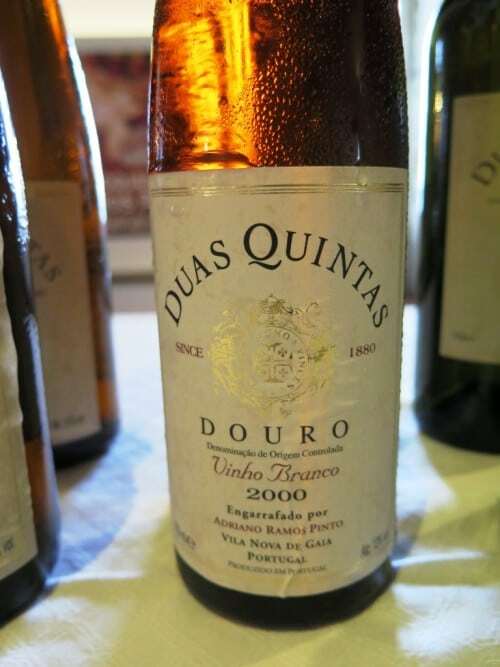 At Quinta dos Bons Ares, the extreme heat didn’t affect negatively the final maturity, on the contrary, it improved it due to smoother and constant temperatures and the fresh nights. 2009 was characterised by a quick maturation of the grapes in the lower quotas, compensated by the equilibrium of the higher quotas. The final result was surprising. Vinification: We selected 7 white Douro grape varieties from our estates of Ervamoira and Bons Ares. These white grapes were carefully harvested by hand and pressed. The must fermented in French oak casks of various capacities and ages where, after turning into wine, it matured during 7 months on fine lees. The wine was bottled in May 2010. Vinification: We selected 4 white Douro grape varieties from our estates of Ervamoira and Bons Ares: Rabigato, Viosinho, Folgazão and Arinto. The carefully harvested white grapes were pressed. The must fermented in French oak casks of various capacities and ages where, after turning into wine, it matured during 7 months on fine lees. This wine was bottled in May 2011. Vinification: We selected 4 white Douro grape varieties from our estates of Ervamoira and Bons Ares: Rabigato, Viosinho, Folgazão and Arinto. The carefully harvested white grapes were pressed. The must fermented in French oak casks of various capacities and ages where, after turning into wine, it aged for 7 months on fine lees. This wine was bottled in May 2012. Vinification: We selected 4 white Douro grape varieties from our estates of Ervamoira and Bons Ares: Rabigato, Viosinho, Folgazão and Arinto. The carefully harvested white grapes were pressed. The must fermented in French oak casks of various capacities and ages where, after turning into wine, it aged for 7 months on fine lees. This wine was bottled in May 2013. Vinification: We selected 4 white Douro grape varieties from our estates of Ervamoira and Bons Ares: Rabigato, Viosinho, Folgazão and Arinto. The carefully harvested white grapes were pressed. 75% of the must fermented in stainless steel vats and 25% in French and Austrian oak barrels of various capacities and ages where, after turning into wine, it aged for 9 months on fine lees. This wine was bottled in July 2014. Vinification: We selected 3 white Douro grape varieties from our estates of Ervamoira and Bons Ares: Rabigato, Folgazão and Gouveio. The grapes are harvested by hand and taken to the winery in small boxes, separated according to variety and plot; the must was obtained by direct pressing, following cold maceration. The clean must fermented in stainless steel vats and in French and Austrian oak barrels (25%) of various capacities where, after turning into wine, it aged for 9 months on fine lees. This wine was bottled in June 2015. Tasting note: a delicate toasty, nutty burnish to the nose with sweet yellow plum, green apple peel and hints of pastis/anise and lime zest which follow through on an expressive palate. 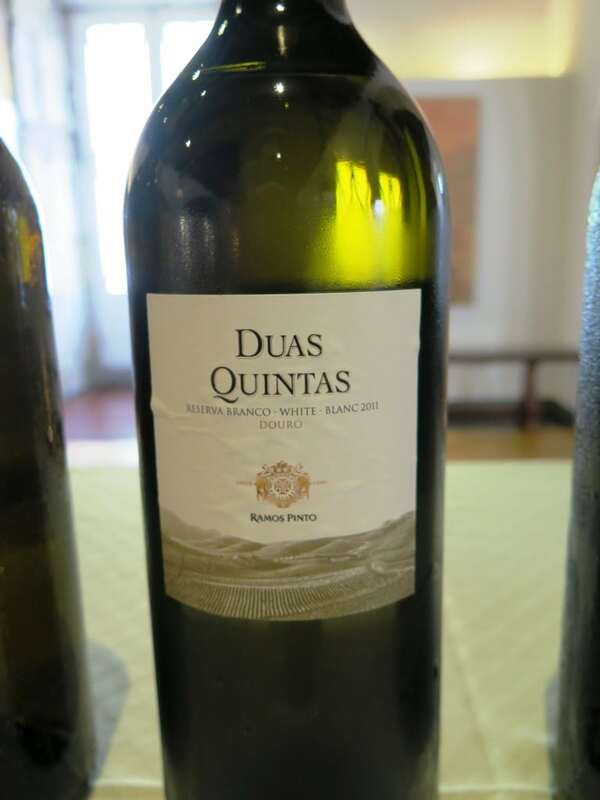 It has the richness with delicacy which categorises my favourite Duas Quintas whites. A long, mineral lemony finish completes this stand out vintage. 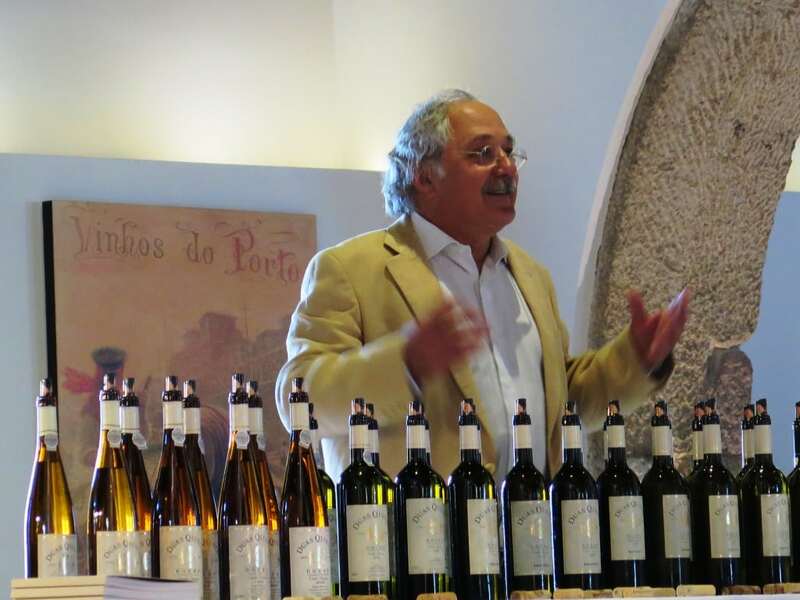 The wines were tasted on Friday, 9 October at Ramos Pinto’s HQ in Vila Nova de Gaia.